Hanby PetroAnalysis has developed a new method for fingerprinting hydrocarbons including crude oils; Hanby Chemical Reaction Spectrophotometry (CRS). 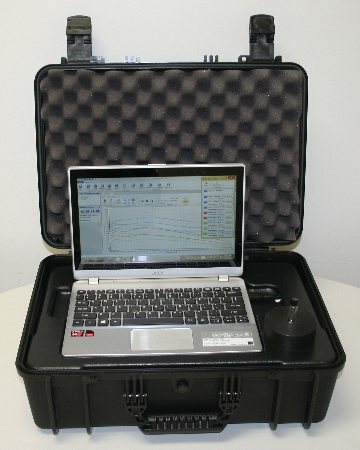 The new Hydrocarbon ID is a field device that utilizes a chemical reaction and a spectrometer to get a spectral curve or fingerprint of the hydrocarbon for both qualitative and quantitative analysis. This new technology puts a “Lab in the Field” and represents a “Paradigm Shift” in the Oil Industries Exploration and Production. Hanby’s CRS has been called “Disruptive Technology” and has been referred to as “The Holy Grail” for Oil and Gas. Hanby PetroAnalysis' Hydrocabon ID performing Hanby Chemical Reaction Spectrophotmerty (CRS).